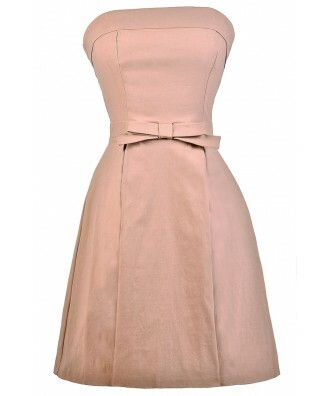 You have added Can't Hardly Wait Strapless Bow Front Dress in Blush into shopping cart. You'll effortlessly command all the attention when you show up in this simple, yet chic strapless dress with a fabric bow in the front. The Can't Hardly Wait Strapless Bow Front Dress is made of a substantial fabric with some stretch to it. 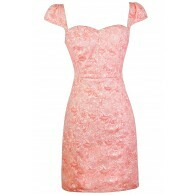 It has a strapless neckline with a lined and lightly padded bust. The empire waistband is decorated with a fabric bow at the center, adding a girly touch. The attached skirt has an A-line cut. A hidden back zipper completes this dress. The Can't Hardly Wait Strapless Bow Front Dress would look nice paired with pumps, wedges, or strappy heels. 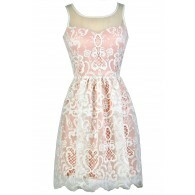 This is a dress that can be dressed up for a dance or semi-formal party. You could also wear it more casually with wedges as a summer sundress. This classic strapless style can be worn for years to come. Details: Made in USA. Lined at bust. Lightly padded bust. Hidden back zipper. 75% rayon, 21% nylon, 4% spandex. Hand wash cold or dry clean. Small measurements: Length from top of bust to hemline: 30". Bust: 30". You have added Can't Hardly Wait Strapless Bow Front Dress in Blush into Wishlist. 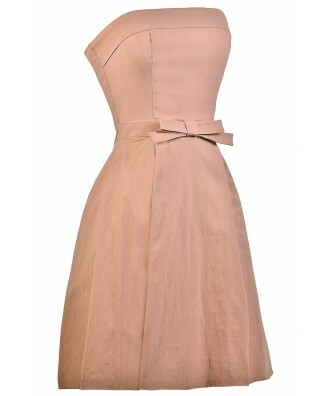 You have added Can't Hardly Wait Strapless Bow Front Dress in Blush for Stock Notification. 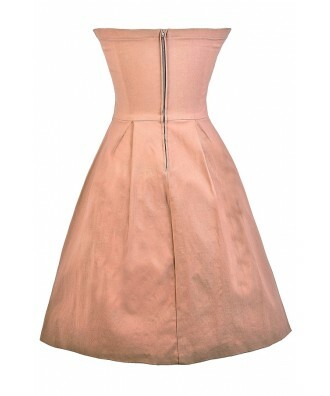 You have set Can't Hardly Wait Strapless Bow Front Dress in Blush as a loved product. 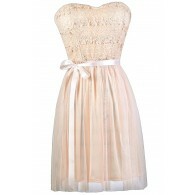 You have removed Can't Hardly Wait Strapless Bow Front Dress in Blush as a loved product.